The city of New Orleans has acquired two wharves on the Mississippi River, opening up a portion of the riverfront that will give the public contiguous access between Spanish Plaza and Crescent Park in the Bywater. The port is working with various “hospitality partners” to shore up $15 million to convert the wharves into public park spaces. Some public access to the riverfront is expected to be provided in 2018, according to the news release. Once again, the New Orleans region serves another purpose for the middle 2/3 of the United States: to manage the water flowing through the lower part of the Mississippi River, so it does not exceed 1.25 million cubic feet per second in New Orleans, allowing the port to remain active, the population to stay in place and reduces the potential for the loss of property. The multilayered flood-control system is formally known as The Mississippi River & Tributaries Project. Administered and built by the Mississippi River Commission and the U.S. Army Corps of Engineers, the project was launched after the disastrous Mississippi River Flood of 1927. The project was authorized by Congress in 1928. Before the 1927 flood, levees were the only safeguards used to combat river flooding. Studies to determine the best location for a spillway along the lower river had identified one at the site of the 19th century Bonnet Carré Crevasse, about 33 river miles above New Orleans. Between 1849 and 1882, four major crevasses had occurred at this location. In fact, during the flood of 1849, a 7,000-foot-wide crevasse at Bonnet Carré flowed for more than six months . The Bonnet Carré Spillway consists of two basic components: a control structure along the east bank of the Mississippi River and a floodway that transfers the diverted flood waters to the lake. The spillway was built in response to the Great Mississippi Flood of 1927 that inundated much of the Mississippi River basin. Corps New Orleans District commander Col. Richard Hansen said Tuesday that he expects all 350 bays of the spillway’s weir to be opened. Each bay has 20 creosoted timber “needles” that must be pulled by cranes moving on a rail atop the weir. There are two graveyards located in the spillway. The cemeteries containing the remains of both free and enslaved African-Americans are under several feet of sediment. According to investigative reporter Shonna Riggs, “The location of the gravesites was a mystery until the 1970’s when the US Corp of Engineers was attempting to excavate a ditch in the spillway. According to the Louisiana Historical Preservation Society, there are 14 graves located in the Kugler Cemetery and 144 in the Kenner Cemetery. The artifacts discovered during the 1986 study included coffin furniture, coffins, grave markers, cultural remains, and human remains.The cemeteries, named Kenner and Kugler, are black burial plots which appear to date from the early 1800s to 1929. The sites are located on former adjoining 19th- and early 20th-century sugar plantations in St. Charles Parish. According to oral histories, both cemeteries were dedicated burial plots on the back side of their respective plantations. When the Spillway gates are opened, the cemeteries are flooded with up to 30 feet of water diverted from the Mississippi River into Lake Pontchartrain. The January opening marks the earliest that the 5.7-mile-long spillway connecting the Mississippi to Lake Pontchartrain has been opened, and its 11th opening, since it was completed in 1931. The Morganza spillway stands between the Mississippi and the Morganza Floodway, which leads to the Atchafalaya Basin and the Atchafalaya River in south-central Louisiana. Its purpose is to divert water from the Mississippi River during major flood events by flooding the Atchafalaya Basin, including the Atchafalaya River and the Atchafalaya Swamp. In an extreme flood event, a major release of water from the Morganza Spillway into the Morganza Floodway and Atchafalaya Basin inundates not only the floodways themselves (between their levees), but extensive additional areas of southern Louisiana throughout the Atchafalaya Basin. At risk in the Atchafalaya Basin are Morgan City (population 13,500), various smaller populated places, many farms, thousands of oil and gas wells, and considerable swampland. Inhabitants know that the region is a natural floodplain, and the Corps of Engineers issues written notices annually to all interests reminding them of the possibility that it might open the spillway and flood the area. Any decision to open the spillway must be carefully planned to give ample warning and protect life and property. Part of that planning process includes the Corps’ preparation of maps known as “inundation scenarios” so that interested parties can discuss how much water, if any, should be allowed through the spillway. About 30 families lived in Fazendeville, and all, like the Cagers, went back generations—perhaps to its beginning around 1870, when Jean Pierre Fazende, a free man of color, New Orleans grocer, and opera lover began subdividing the slim tract of land he’d inherited from his father—also named Jean Pierre Fazende—and selling off parcels to recently freed slaves. In the mid 1800s, local citizens organized to erect a monument in honor of their ancestors’ sacrifice and Andrew Jackson’s victory. Dwindling funds and the Civil War stalled construction, but by the 1890s, the Louisiana Society of the United States Daughters of 1776 and 1812 passionately took up the cause. …Wielding influence and tenacity, she (Robinson) convinced both the railroad and the previously intractable Kaiser Aluminum to donate valuable acreage. Protecting a chapter of history was clearly at the forefront of Robinson’s agenda, yet dispossessing a community was the next, necessary step. “Rather than get tangled up with Martha Robinson,” write Abbye A. Gorin and Wilbur E. Meneray, “politicians considered an alternate course.” Several of these politicians—Congressman F. Edward Hebert, Senators Russell B. Long and Allen J. Ellender—took up Robinson’s cause. They introduced legislation in Congress to purchase land for the park in time for the Battle’s 150th anniversary. The resolution passed, and President Kennedy signed it into law just months before he was assassinated. “The government did eminent domain on us in 1964,” explains Valerie Lindsey Schxnayder, whose father was the last to leave Fazendeville. He moved his entire home —by trailer—to Reynes Street in the Lower Ninth Ward, where it was flooded the following year in Hurricane Betsy, and swept down the block in Katrina. In the mid-1960s, the market price for a new home in St. Bernard was around $16,000; residents of Fazendeville received around $6,000 per home. With Lindsey and the other citizens of Fazendeville gone, The Village was wiped away. Every other real estate deal in history fades into insignificance when compared with the Louisiana Purchase. For $15,000,000, France turned over to the United States all of what is now known as Arkansas, Iowa, Kansas, Missouri, Nebraska and Oklahoma; three-quarters of Louisiana, Colorado, Montana and Wyoming; half of Minnesota and North Dakota; a quarter of New Mexico and small parts of Mississippi, Idaho and Texas. And Napoleon Bonaparte made up his mind to make that sale while he was mad as a hornet in his bathtub! The date was December 20, 1803. Louisiana had been French from the discoverers to 1769, then Spanish until November 30, 1803, French again for 20 days, and now was to become American. Up there in the Sala Capitular of the Cabildo, the second-story room on the corner of St. Peter and Chartres streets today, the great valley empire of the Louisiana Purchase was to be transferred with pompous formality to the United States of America. In the Sala Capitular the dignified gentlemen were exchanging credentials. Pierre Clement Laussat, colonial prefect of Louisiana, who for 20 days had ruled the huge province for Napoleon Bonaparte, first consul of France; William C.C. Claiborne, first American governor of Louisiana; General James Wilkinson of the United States army. Laussat was preparing to turn over to Claiborne and Wilkinson the vast territory Napoleon Bonaparte had sold for $15,000,000 in the name of the republic of France to President Thomas Jefferson in the name of the United States of America. The 10,000 population of New Orleans, streaming toward the Place d’Armes, packed inside of it, couldn’t have dreamed of all that. Nor the 50,000 population of the great empire up the valley. All they knew was that the flags and the ground rules were changing again. Most of them hated the change. They had been successively subjects of Spain, citizens of the republic of France, citizens of the United States of America, all within 22 days. The spectators watched the troops march into the square and take up their positions, in even ranks. There was the New Orleans militia under Colonel Belle-chasse. There were United States army regulars in the tight knee-breeches and tailcoats, their criss-cross white belts, their heavy smooth-bore muskets. Here in a group stood the “Kaintocks” – Kentucky flatboatmen, many in Indian buckskin and coonskin caps. Some carried the long Kentucky rifles on the arms, were belted with hunting knife and Indian tomahawk. Inside the Cabildo the dignified gentlemen had accepted the others’ credentials. Clerks had droned through the lenghty wording of international documents. The gentlemen rose and solemnly shook hands. 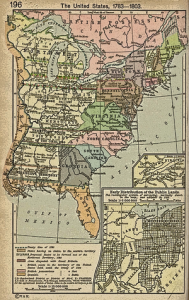 Governor Claiborne produced his first proclamation of this vast new land he ruled. It was in three languages – English, French and Spanish. Claiborne, Wilkinson and Laussat advanced to the second-story windows of the Cabildo. The proclamation was to be read in all three languages. The United States of America notified the world thereby that Louisiana was now American. Some cheers rose. Then an armed color guard marched to the flagpole in the middle of the Place d’Armes. Solemnly they hauled down the flag of France. Solemnly they hoisted to the top of the pole the Stars and Stripes. And the United States army regulars at the sharp command of an officer raised their muskets and fired a salute to the flag that, with added stars, floats over Louisiana yet. Then the Claiborne proclamation was read. Americans began pouring into New Orleans from that day. The 1810 census, seven years later, shows 17,242 population for the city, 76,556 population for Louisiana. New Orleans was launched on her career as the greatest city of the South. Incredible today sounds the welter of motives and circumstances that led to that transfer of Louisiana. They didn’t even know many of the details, then , those folks who feasted and danced and drank deep at the banquets and the brilliant ball given in New Orleans that night of December 20, 1803. Documents then buried in private and secret archives have come to light since that day. Now the almost unbelievable picture is clear. First of all, Napoleon Bonaparte literally made up his mind to sell Louisiana in a fit of rage while he was in his hot bath. It was a strangely shaped copper tub with its own charcoal stove attached. Napoleon’s circulation was poor. He awoke cold. He would sit an hour in that simmering, soapy, perfumed water. Such a tub stands in the Cabildo today. In Paris, then , were two Americans, Robert R. Livingston, brilliant New York lawyer (who never saw the Louisiana he helped buy for his nation). and James Monroe, later president of the United States. They came with President Thomas Jefferson’s proposal to buy Louisiana. Napoleon delegated to deal with them Barbe Marbois, “peer of France.” Actually, Robert R. Livingston and Barbe Marbois did about 90 per cent of the negotitating. Monroe arrived late; was sick in bed most of the time. Napoleon was planning to invade the British Isles and conquer his worst foes in their homeland. He needed money for army and fleet. But he hadn’t made up his mind yet to sell Louisiana. A letter to his brother, Joseph Bonaparte, tells how he did make up his mind in his bath. Joseph and Jerome, two of his brothers, called on him that morning. Jerome was brilliant in a new uniform of light blue and silver. Napoleon’s valet admitted them. Napoleon, neck-deep in hot water, his brothers standing near the tub, suggested it might be a good thing to sell Louisiana. The brothers fought the idea hotly. Their language angered Napoleon. Suddenly, as the three screamed at each other, quarrelling, excited Corsicans all in the midst of a family battle, Napoleon leaped to his feet. A wave of soapy water deluged Jerome Bonaparte, ruined his costly new uniform. Their high, shrill voices alarmed the servant. He came running from the ante-room, thought he saw the brothers about to fight each other, and fainted with fear and excitement. Napoleon, naked, leaped from the tub. The three brothers bent over the unconscious servant, reviving him. But Napoleon’s last defiance of his brothers: “Who rules France? You or I? If I want to sell Louisiana, I will!” became his fixed determination. United States AFTER Louisiana Purchase. Livingston and Monroe learned to their delight that Napoleon would sell. After long haggling, the price was fixed at $15,000,000, a tremendous sum in those days. The treaty was signed at last by Livingston, Monroe, and Barbe Marbois. A letter from Livingston and Monroe to Rufus King, then American minister to England (first of the long line of what became ambassadors to St. James), was the first notification to anyone that the treaty was signed. The treaty was signed and sealed in triplicate. Thomas Jefferson admitted he “strained his power until it cracked” making that $15,000,000 purchase. He had to borrow the money. And the lender was the London banking house of the Barings – the great English financial firm of the day! It sounds incredible that an English banking firm lent the money to the United States, England’s recent victorious enemy, to pay Napoleon Bonaparte for Louisiana when England wanted Louisiana, anyway, and it was Europe’s open secret that Napoleon planned to invade England and was seeking desperately to finance the proposed expedition. But they did. Napoleon spent the money on army and fleet, the fleet that never sailed from Boulogne to land that army on English soil. The adverse winds, the stormy channel crossing, saved England that invasion. And, as the War of 1812 and the Packenham expedition that failed a the Battle of New Orleans in 1815 revealed, England had planned to take Louisiana by force, anyway. But that was all in the remote future, undreamed by those crowds in New Orleans that fateful day of December 20, 1803. Some of them cheered, some complained. A lot of them went to sleep to wake with headaches caused by anything from champagne and madeira, port and sherry, to Monongahela whiskey and West Indian rum. And with the ceremonies all over, Governor Claiborne started out the next day to solve problems practically unsolvable, to govern in American fashion, as American citizens made overnight, a population of some 60,000 that language of most of whom he didn’t even understand! The activist blogger conference held annually since Hurricane Katrina will be held this coming weekend at Xavier. The Rising Tide Conference is an annual gathering for everyone who loves New Orleans and is working to bring a better future to all its residents. Leveraging the power of bloggers and new media, the conference is a launch pad for organization and action. Our day-long program of speakers and presentations is tailored to inform, entertain, enrage and inspire. We come together to dispel myths, promote facts, highlight progress and regress, discuss ideas, and promote sound policies at all levels. We aim to be a “real life” demonstration of internet activism. Exciting programming announcements are updated regularly, so please check the Schedule page of our website for specific information about this year’s program. This year we are excited to have Retired LT. General Russel L. Honore as our Keynote speaker.